Coach Nigel Bowen taking the Dartmouth players through the paces yesterday at the Anna Regina Community Center Ground. 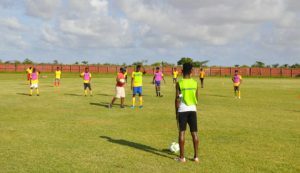 friendly match at the Anna Regina Community Center Ground. 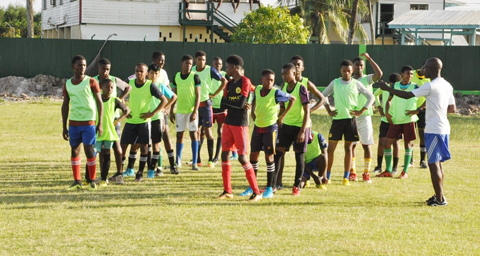 Timehri Panthers, the EBFA champions and Dartmouth, the EPFA winners will engage each other from 11:00hrs today in a match that will allow both clubs to assess the strengths and weaknesses of the players in a competitive atmosphere. EPFA President Ms. Maxine Stewart and President of Timehri Panthers expressed delight at the players being able to take on each other even ahead of the clash of all Member Association winners in the near future. Stewart said that Dartmouth FC has a group of talented players who are eager to show what they can do against another association champion. Timehri Panthers President Adrian Gonsalves informed that they have 22 players in Essequibo and could have taken more but there was not enough space on the bus. “From our perspective, we welcome this collaboration between the EBFA, EPFA and our club. We have been taking these players and other age group players around the country to engage other teams because we believe that this is how these players will develop and grow into very good players. EPFA also mentioned that Dartmouth FC would be paying a return visit to the EBFA sometime soon, the parties would be discussing same before the Panthers make their way back home, today. The team and officials travelled to Essequibo, yesterday.